wx.Validator is the base class for a family of validator classes that mediate between a class of control, and application data. To transfer data from a C++ variable or own storage to and from a control. To validate data in a control, and show an appropriate error message. To filter events (such as keystrokes), thereby changing the behaviour of the associated control. Validators can be plugged into controls dynamically. To specify a default, “null” validator, use wx.DefaultValidator . For more information, please see Validator Overview. Clone All validator classes must implement the Clone function, which returns an identical copy of itself. GetWindow Returns the window associated with the validator. IsSilent Returns if the error sound is currently disabled. SetWindow Associates a window with the validator. SuppressBellOnError This functions switches on or turns off the error sound produced by the validators if an invalid key is pressed. TransferFromWindow This overridable function is called when the value in the window must be transferred to the validator. TransferToWindow This overridable function is called when the value associated with the validator must be transferred to the window. Validate This overridable function is called when the value in the associated window must be validated. Validator is the base class for a family of validator classes that mediate between a class of control, and application data. All validator classes must implement the Clone function, which returns an identical copy of itself. This is because validators are passed to control constructors as references which must be copied. Unlike objects such as pens and brushes, it does not make sense to have a reference counting scheme to do this cloning because all validators should have separate data. This base function returns None. Returns the window associated with the validator. Returns if the error sound is currently disabled. Associates a window with the validator. This function is automatically called by wxWidgets when creating a Window-derived class instance which takes a wx.Validator reference. will automatically link the TextValidator instance with the wx.TextCtrl instance. This functions switches on or turns off the error sound produced by the validators if an invalid key is pressed. suppress (bool) – If True, error sound is not played when a validator detects an error. If False, error sound is enabled. This overridable function is called when the value in the window must be transferred to the validator. False if there is a problem. This overridable function is called when the value associated with the validator must be transferred to the window. This overridable function is called when the value in the associated window must be validated. 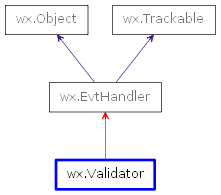 parent (wx.Window) – The parent of the window associated with the validator. False if the value in the window is not valid; you may pop up an error dialog.